iPhone does live up to its name as one of greatest invention in 21st century, but it some times can frustrate us the most. Some of your iPhone data, for example, the WhatsApp chat history will be gone just with a careless tap on the unintentional option. It is necessary to learn how to back up whatsapp messages, for one thing, the messages can be saved for future memory, for another, important information are included in the whatsapp messages, some of them may be used as crucial evidence once get involved in legal issues. Here in this post, I would like to share some different ways to back up whatsapp messages to guard against incautious deletion or inexplicable losing. 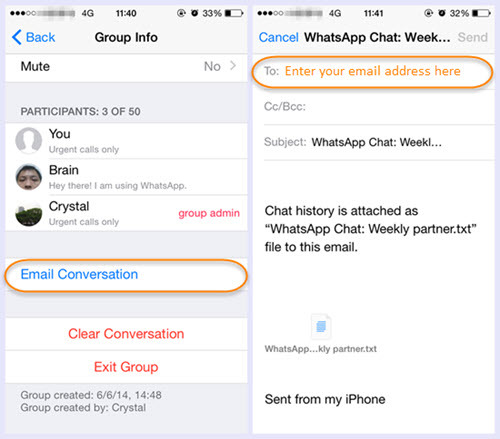 To make a manual backup of your chats at any time, go to WhatsApp Settings > Chats > Chat Backup and tap Back Up Now. You can also enable automatic, scheduled backups by tapping Auto Backup and then choosing your backup frequency. This will back up your chats and media to your iCloud account; you can choose to include or exclude videos from the backup. The iCloud backup process can take a while to complete, depending on your Internet connection and backup size. Notes: You must have iOS 5.1 or later, and need to sign in to iCloud. 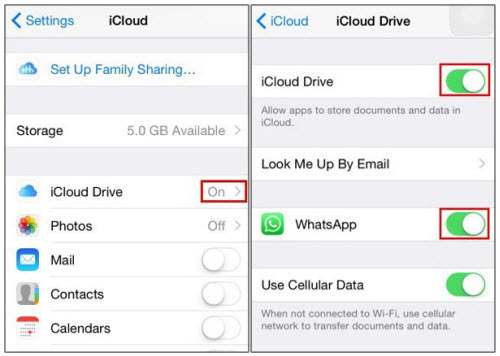 Make sure iCloud Drvie (iOS 8 or later) or Document & Data (iOS 7) must be tapped ON. Beside, there must be enough free space on both your iPhone and iCloud. You can also email a whatsapp conversation for record keeping. Here is how. > Launch and log into WhatsApp on your iPhone. > Click on any individual chat or group chat. > Tap on the name of contact or group name from the top. Now you can see Contact Info OR Group Info on the screen. > Scroll down and tap on Email Chat. A menu will swipe up with two options: Attach Media and Without Media Tap on either of the options. > You will be landed on the screen, from where you can directly send your WhatsApp chat to any email. Just type in the email id and tap on Send. If you prefer backing up the WhatsApp messages, you can choose to back up your whatsapp chat history to your computer through iTunes. > Launch iTunes. Make sure you have the latest version of iTunes, or if you are notified about the updates, please download and install. > Connect your iPhone to iTunes. Note: Make sure iCloud is turned off on your iPhone or iPad. You can’t create backups using iTunes when iCloud is enabled. Go to Settings > iCloud > Storage & Backup and turn off the iCloud Backup switch. > After the process ends, you can see if your backup finished successfully in iTunes Preferences > Devices. Or you can find the iTunes backup through the following paths. There is another way to back up WhatsApp messages selectively to computer through a powerful third party utility named iFonebox, which can export the whatsapp chat history selectively to computer for saving. Here is how. > Install and run iFonebox. Note: iFonebox is available for both Windows and Mac, please choose the right version to download and install. Note: If your iPhone is not detected by iFonebox, please make sure whether you have plugged in iPhone properly and whether you have trusted your computer on iPhone. > Choose WhatsApp Messages to scan selectively by clicking on the icon for WhatsApp from the screen listing all the supported data categories. > After the data scanning is finished, all the whatsapp conversations will be presented in a list for previewing. Note: If you are running the trial version, part of the messages will be displayed as asterisks, please purchase the full version for full review. > Please choose all the whatsapp messages or simply choose whatever you want to recover and transfer to your computer for backup. > After the recovering and transferring is finished, you will be brought to the destination folder where the exported whatsapp messages is saved. 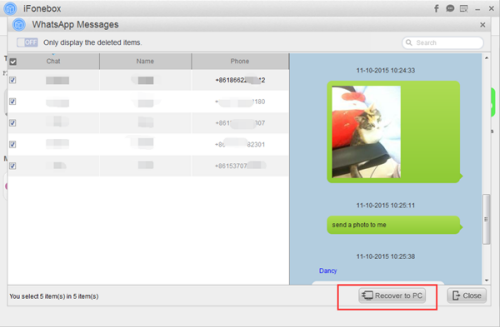 How To Back Up WeChat Messages on iPhone? 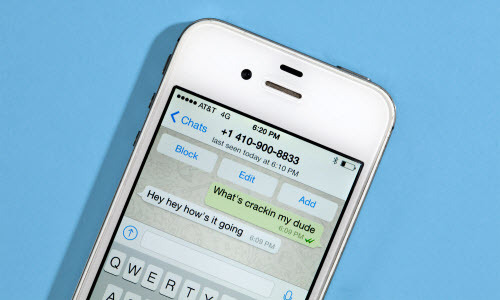 How To Recover WhatsApp Messages on Damaged iPhone? How to Restore iPhone 6s Call History Cleared After iCloud Restore? This entry was posted in Backup/Back Up, Tips and Tricks, whatsapp and tagged back up whatsapp messages on iphone, email, iCloud, iTunes, safely back up whatsapp messages, save iphone whatsapp chat history by IosdroneD. Bookmark the permalink.